The four sets of alphabet worksheets below provide lots of variety for studying and learning individual alphabet letters. They give kids the opportunity to trace, write, and color each letter of the alphabet. Kids will also have the opportunity to recognize words that start with each letter, draw an item that starts with each letter, identify the letters out of a bunch of mixed up letters, and last but not least, circle pictures of objects that start with each letter. Use a worksheet from each section each day of the week! Go to this page to choose from all of the alphabet resources on this site. This set of things that begin with a-z worksheets was created with several purposes in mind. The first was to build upon the knowledge of letter identification. 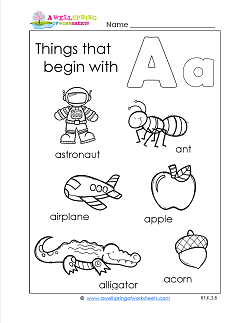 Second, these worksheets introduce kids to the concept of identifying words that start with each letter of the alphabet. Third, kids can say the words and practice the beginning sound (they have both long and short vowel sounds). And lastly, they can color the pictures and the letters. Need a quick worksheet that employs more than one skill? These alphabet letter looks like sounds like worksheets do just that. Each worksheet will take about 10-15 minutes to complete and employs at least four of your kid’s skills: writing, drawing, coloring, and reinforcing their knowledge of the alphabet. 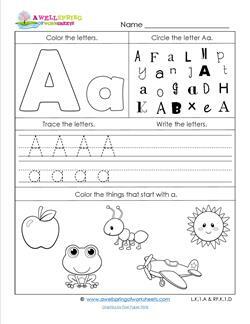 Kids trace and write the letters and draw a picture of something that starts with each letter. 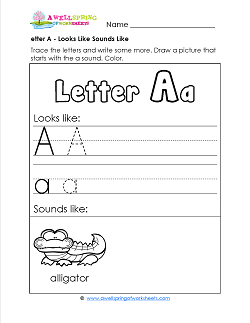 There’s already a picture of an animal on each page to give the kids an example of the letter sound. Welcome to a refreshingly new kind of set of letter identification worksheets! Every letter recognition worksheet has a “picture” in a frame created with letters. The picture is of something that starts with the letter for that worksheet and is accompanied by a sentence using words with that letter in it. Each frame has 12 of the letters for that worksheet, 3 on each side. Circle the letters. If you look carefully, you will also find a sight word hidden either across the top or bottom of each frame. 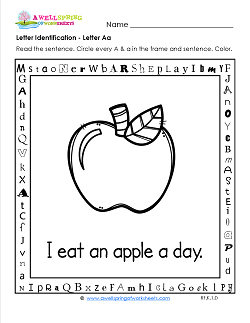 Have we got some fun ABC worksheets for you! They target four different skills to keep little hands busy. Kids get to color the uppercase and lowercase bubble letter (fine motor skills), circle the letter in different fonts (letter identification), trace the uppercase and lowercase letters and write a few more (letter formation), and color the two or three objects that begin with the letter sound (letter sound correspondence). Whew! That’s a lot to pack into one worksheet. I’m sure your kids are up to the challenge!